The Friends of the Scottsdale Public Library helped raise $12,500 in donations for the Scottsdale Children’s Learning & Play Festival, held October 1 at WestWorld. 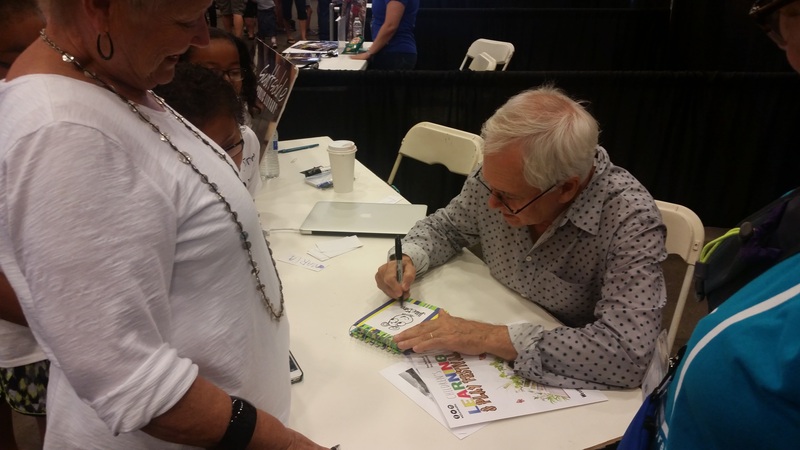 Author Marc Brown draws Arthur the Aardvark for a Festival attendee. The event welcomed over 12,000 children and their families to enjoy author presentations, kids activities and musical performances. The headliner was Marc Brown, author of the Arthur the Aardvark book series that was adapted into a PBS children’s show. Brown held two presentations for the children, then signed autographs. The Friends paid the speaker fees and travel expenses for the authors in attendance, contributing thousands of additional dollars to the event. While this was the first time the Festival was put on, it was considered a success and will hopefully become a yearly tradition. This entry was posted in Events and tagged authors on October 1, 2016 by Trey Granger.